Open from 7:00 a.m. to Sunset every day of the year. May 1 – October 31, Tuesday – Saturday, 9:00 a.m.-2:00 p.m.
November 1 – April 30, Wednesday – Sunday, 10:00 a.m.-3:00 p.m. There are no gallery exhibitions scheduled between May 5 and June 30, while the pond restoration project is in progress. What is happening to Pond 1 at Agua Caliente Park? Pima County Natural Resources, Parks and Recreation is moving forward with the next phase of the Agua Caliente Park Pond 1 Restoration Project, which is to drain the pond. Well water is no longer being pumped into Pond 1 and the remaining water from Pond 1 is being gradually siphoned into Pond 2. Evaporation will assist in the effort to drain the pond as the temperatures increase. As a result, the public will see the water level of Pond 1 dropping. There will be aquatic vegetation and mud exposed as the water level drops. We do not know how long it will take to completely drain the pond. The Agua Caliente spring continues to flow at the present time probably due to the large amount of winter precipitation this year. We anticipate the spring flow will eventually decrease or stop as it has in past years as the hotter and drier days continue. When will the park be closed? 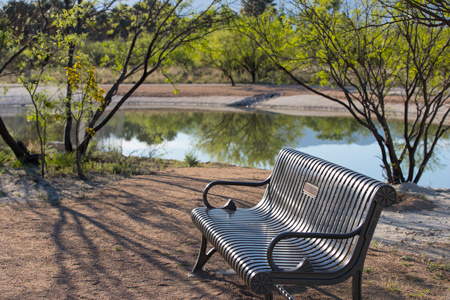 Pima County anticipates the park closing for public safety when the construction phase of pond renovation begins. Because of the uncertainty of pond drying time, a park closing date has not yet been identified. We will update the web site when we have a clearer idea of the timeframe. Agua Caliente, literally meaning hot water, is a unique 101-acre park that features a perennial warm spring and pond that is home to an exceptionally rich mix of plants and animals. Agua Caliente Park has a long and interesting history with evidence of human habitation dating back about 5,500 years. In 1873, a ranch and health resort was developed to promote the curative properties of the warm springs. In 1984 local businessman Roy P. Drachman donated over $200,000 toward the purchase of Agua Caliente Ranch and Pima County named the park in honor of this contribution. Roy P. Drachman Agua Caliente Park opened to the public on January 19, 1985. Improvements have added the modern conveniences without eliminating the historical aspects of the park. On July 9, 2009 Agua Caliente Ranch Rural Historic Landscape was placed in the National Register of Historic Places. The flow rate from the spring has varied over time reportedly as high as 500 gallons per minute to an unmeasurable seep in recent years. The sources and pathways for the water that now infrequently comes out of the natural spring head are not fully understood. Rainfall and snow on the Santa Catalina Mountains, shallow and deep rock stresses and fractures as well as significant heat generated hundreds of feet below the surface, all contribute to the complex and changing system. In recent years the pond has been maintained with water pumped from a well located on the property. Visit the renovated 1870s Ranch House Visitor Center and Art Gallery, tour the park on one of the many naturalist led walks, or picnic in the shade of mature palm trees and native mesquite trees. Browse through the many bird-related items for sale in Tucson Audubon Society’s Nature Shop. Stroll the network of accessible paved and gravel trails with interpretive signs that explain the geology and history of the warm spring and the natural and human history of the site. A Group Use Permit does not guarantee parking or a specific location in the park. All sites are on a first come basis. Park open hours 7:00 a.m.-sunset. All group activities must conclude before sunset. Areas not available for group activities: the Ranch House Visitor Center, Rose Cottage, patios, and island. Prohibited: alcoholic beverages, rows of chairs, arches, pop-up shade canopies, tents, carpet, balloons, confetti, use of the restrooms as changing areas, and vehicles beyond the parking lot. Activities that involve collecting of water, plants, animals; netting, banding or marking of wildlife, or access to restricted areas, is considered research or science study. Research and scientific studies must have prior permission from the Pima County Natural Resources, Parks and Recreation.